Child labour is declining far too slowly, in the midst of unprecedented growth in migration and forced displacement that aggravate the situation, said representatives of governments, workers and employers in the Buenos Aires Declaration on Child Labour Forced Labour and Youth Employment. The document, signed at the end of the Nov. 14-16 meeting, recognises that unless something changes, the goals set by the international community will not be met. As a result, there is a pressing need to “Accelerate efforts to end child labour in all its forms by 2025,” the text states. In the 17 Sustainable Development Goals (SDG), target seven of goal eight – which promotes decent work – states that child labour in all its forms is to be eradicated by 2025. “For the first time, this Conference recognised that child labour is mostly concentrated in agriculture and is growing,” said Bernd Seiffert, focal point on child labour, gender, equity and rural employment at the United Nations Food and Agriculture Organisation (FAO). “While the general numbers for child labour dwindled from 162 million to 152 million since 2013, in rural areas the number grew: from 98 to 108 million,” he explained in a conversation with IPS. 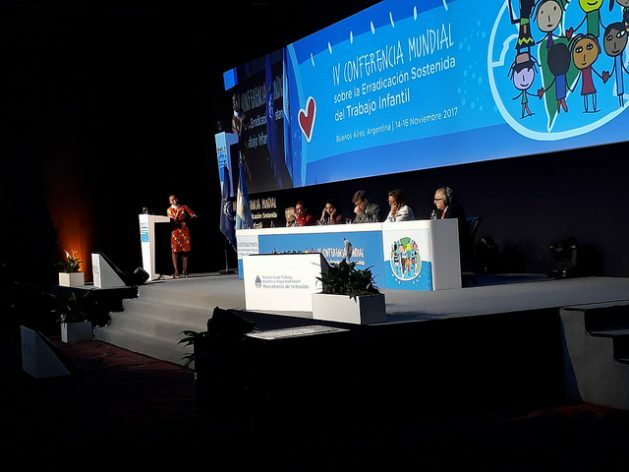 The declared aim of the Conference, organised by the Argentine Ministry of Labour, Employment and Social Security with technical assistance from the International Labour Organisation (ILO), was to “take stock of the progress made” since the previous meeting, held in 2013 in Brasilia. Guest of honour 2014 Nobel Peace Prize-winner Kailash Satyarthi said he was “confident that the young will be able to steer the situation that we are leaving them,” but warned that it would not make sense to hold a new conference in four years if the situation remains the same. Satyarthi was awarded the Nobel Prize for his work in his country, India, in defence of children’s rights, and in particular for his fight against forced labour, from which he has saved thousands of children. “We know that children are used because they are the cheapest labour force. But I ask how much longer we are going to keep coming to these conferences to go over the same things again. The next meeting should be held only if it is to celebrate achievements,” he said. “We must promote the incorporation of technologies and good agricultural practices to allow many poor families to stop having to make their children work,” she told IPS. According to the ILO, as reflected by the final declaration, 71 percent of child labour is concentrated in agriculture, and 42 percent of that work is hazardous and is carried out in informal and family enterprises. “There are also gender differences. While it is common for children to be exposed to pesticides that can affect their health, girls usually have to work more on household chores. In India, for example, many girls receive less food than boys,” said Sazaki. Children were notably absent from the crowded event, which brought together government officials and delegates of international organisations, the business community and trade unionists. Their voice was only heard through the presentation of the document “It’s Time to Talk”, the result of research carried out by civil society organisations, which interviewed 1,822 children between the ages of five and 18 who work, in 36 countries. The study revealed that children who work do so mainly to help support their families, and that their main concern is the conditions in which they work. They feel good if their work allows them to continue studying, if they can learn from work and earn money; and they become frustrated when their education is hindered, when they do not develop any skills, or their health is affected. “We understand that children who work have no other option and that we should not criminalise but protect them and make sure that the conditions in which they perform tasks do not put them at risk or prevent their education,” said Anne Jacob, of the Germany-based Kindernothilfe, one of the organisations that participated in the research. “After talking with them, we understood that there is no global solution to this issue, but that the structural causes can only be resolved locally, depending on the economic, cultural and social circumstances of each place,” she told IPS. The participants in the Conference warned in the final declaration that armed conflicts, which affect 250 million children, are aggravating the situation of child labour. In this respect, she pointed out that hundreds of thousands of children are left without the possibility of access to formal education every year in different parts of the world. Her office counted 750 attacks on schools in the midst of armed conflict in 2016, while this year it registered 175 in just one month. “To fight child labour and help children, we have to think about mobile learning and home-based education. Education must be provided even in the most fragile situations, even in refugee camps, since that is the only means of providing normality for a child in the midst of a conflict,” said Gamba. In the end, the Conference left the bitter sensation that solutions are still far away. ILO Director-General Guy Ryder warned that the concentration of child labour in rural work indicates that it often has nothing to do with employers, but with families. It is easy for some to blame transnational corporations or governments. But the truth is that it is everyone’s fault, he concluded. Without eliminating poverty and providing opportunity to acquire education to the children, child labour continue to persist. Just passing of laws are not enough. The world has to find out practical solution. Why is it that the companies and managers are left to do the most egregious things that governments, officials, NGOs and the general public are all well aware of and none of these use the international law readily available to stop them. It smacks of the same malfeasance as violence to women that no ‘official’ made any move to stop for centuries and they are just as liable as the parasitic predators.